The lakes in Himmerland are very varied. There are oligotropic lakes as Lake Navn and Madum and eutropic as Lake Hørby. 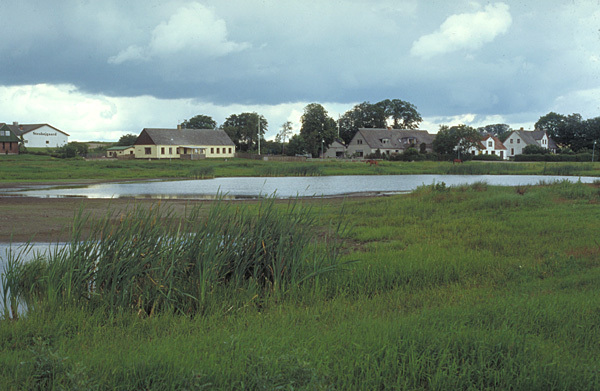 But smaller lakes can also be interesting as the village pond in Voldsted (the picture). Today most of the village ponds in Denmark has been changed to rain basins or fire basins with steep sides of stone or concrete. In Voldsted the area surrounding the village pond is still being grazed as in older times. The water level in the pond is varying must through the year and when the pond dries out during the summer, a special vegetation develops on the dry and trampled mud.